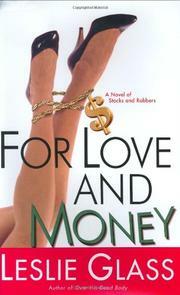 More love than money in Glass’s latest venture into Susan Isaacs territory. Pity Annie Custer. She’s haunted by the specter of her dead mother speaking with the wrong accent. A horrendous combination of Post-Traumatic Stress Disorder and betrayal by Matthew Mack, the family friend who sued her husband and has kept him from working at the brokerage alongside her ever since the collapse of the World Trade Center. One of her perfect daughters, refusing to attend the top college that accepted her, lies in bed looking at the ceiling; the other perfect daughter is experimenting with pot, though Annie doesn’t know that yet. Nor does she know that Dina, her perfect housekeeper, is about to return to Argentina to be with her pregnant daughter. What she does know is that Matthew’s wife Carol, her best friend, is being driven crazy by her mother, who’s dying of cancer, and by her father, a disagreeable liar who’s refused to put his wife’s financial affairs in order. Now Dean Teath has relented, Carol tells Annie, if only she’ll drive out to Staten Island right this minute to take custody of Mamie Teath’s securities. Naturally, Annie drops everything to help. In a twinkling Carol’s mother is dead; Carol’s father is accusing Annie of stealing $260,000 in bearer bonds; and her only defense against the loss of her job and her reputation is Brian Redfield, the well-toned branch manager who’s willing to overlook the fact that she’s as old as he is and take her as his Playmate of the Week. Glass gets off her share of zingers en route to clearing up Annie’s problems, though fewer than in Over His Dead Body (2003). But the sustained note of sitcom hysteria has a flattening effect. By the end, the accusation of grand larceny seems no worse than the loss of a really good cook.